This past week was BlogHer, so before I left I had a little mani-pedi session with India, in a joint effort to both make my feet presentable and assuage my guilt for leaving for the weekend. This would have been a great promotional idea had I actually remembered to pass out the gum at the conference. Instead,I lugged it around in my purse and then brought it all home with me. Next year? In other news of me being forgetful, I did a whole bunch of stuff on Thursday including a party with our MomsLA crew, a party with the completely awesome writing team of MamaPop, and a party with Clever Girls (who hook me up with these pretty sidebar ads), followed by some great conversations in the lobby bar until the wee hours. But I failed to take a single picture of any of it. So we’ll start with Friday morning. Our ShePosts staff, together at last! Esther (in the middle) is the founder, I am the managing editor, and Kim Tracy Prince (on the left) is our all-star writer. I don’t think we’ve been in the same place at the same time all year. When your job is reporting on the news of the blogging world, it means at conferences that nearly every conversation is proceeded with “this is off the record”. I had to constantly remind people that I spent ten years as a therapist, so confidentiality is kind of my gig. But man, I do have some juicy tidbits lined up for that blogging tell-all that is sure to make me hundreds. I met some sweet friends for breakfast on the first big day of the conference. Katherine and Ellie and I were all sporting yellow. Continuing the yellow theme, Heather and I had a little down-time in the cabana. Heather is my editor at Curvy Girl Guide. I kept looking for a pool boy to do our bidding but he was not where to be found. *this is not true, I was a willing participant. On Saturday morning I was invited to a swag suite for breakfast, and it involved neither swag nor breakfast, but rather a very pressured sales pitch to join an affiliate program. The combination of hunger + having my time wasted made me a bit grumpy. Just ask Heather. On Friday, I had lunch with some lovely gals from Microsoft – a nice transition from the morning mayhem. I’m a Windows girl so it was fun to learn about some of the new things on the horizon. Saturday night I had dinner with some more lovely people (there were just so many of them! ), including Karen and Kelly. All three of us are a part of the adoption triad and part of transracial families, and it was so good to sit and chat about some of those unique dynamics with two women I really respect. Mark was planning on bringing the family up on Sunday for a couple kid-friendly events. But a combo of Maile leaving mid-day on Saturday and learning about a potential sitter (thanks Stephania!) made us decide to have them come up early and spend the night. And that’s how I came to crash the Aiming Low party with four kids. When I talk about Aiming Low, I really mean it. I have a baby. In a bar. The kids feasted on meatloaf and mac and cheese, and got their Internet, Hellz Yeah temporary tattoos and custom body art from Robin. They also got to meet their Uncle Nick, who I think was trying to get Karis drunk. Nick is Esther’s husband, and I was really glad he was there for Mark at this conference full of female bloggers. Of which both Mark and Nick are neither. Which made them instant besties. After some carousing at the Aiming Low party, our sitter arrived (hi Katherine!) and we put the kids to sleep and made our way to the CheeseBurgher party. I had some frieds (dancing fuel) and then hit the dance floor. And then we pretty muched danced until our feet bled. Robin and Cecily and Jenny and Aimee and Sarah – so much fun having real-life and internet-life boundaries blur into great friendships. Robin and Deesha are like long lost dancing soul mates. I was a little nervous having Mark at a conference. Would he think that this conference business is just a cover for a bunch of girls getting together to party? (He did). Would he have fun even though he didn’t know a soul? (He did). I am lucky to have an extroverted husband who worked the room better than I did. Okay, remember when I said we danced until our feet bled? Well, that wasn’t entirely true. I did have a wee little incident trying to backtrack up the down escalator after realizing I’d left my purse in the ballroom. You know those rules about wearing shoes on escalators, and only going in the intended direction? Turns out there is a reason for them. And I took quite a tumble that pretty much sliced my toes open, which meant that Mark had to pull me off the elevator in his arms. At which point, I started passing out, because that’s what I do when there is blood+pain. So I just looked like a really, really bad drunk with bleeding feet in front of about 20 other bloggers. My friend Heather helped me to a chair and made sure I was okay, and THEN SHE TOOK PICTURES OF ME. And I can’t even be mad at her, because it’s what I would have done, too. It’s what we do. The next morning we had breakfast with Aimee and Heather, to try to further illustrate to the child that mommy’s friends on the internet are real people, too. Then we went to an event where the kids got to meet Ruby from The Feelings Show. (Best kid’s DVD ever). We love this show. We love Ruby. Can you tell they are a smidge excited? 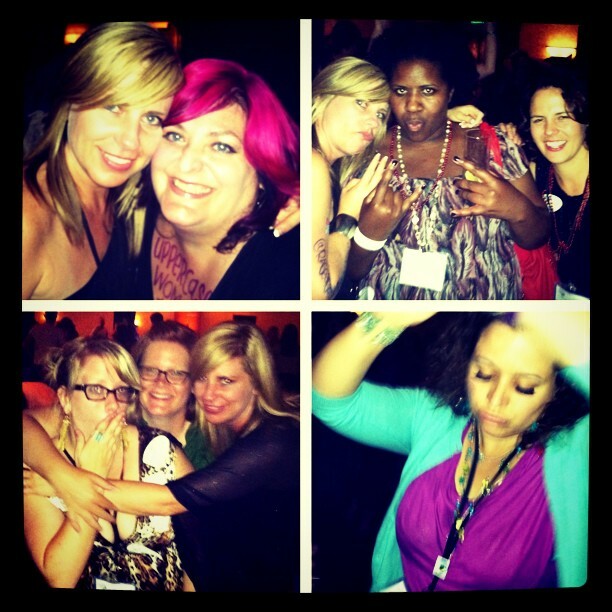 All in all, I had a blast at BlogHer. And I walked away with some really great souvenirs!